I finally had a chance to post a video project I’ve had on the backburner all summer. This video “Exploring Virtual Worlds” is a conceptual piece for a video series I’ll be making over the next few months about virtual worlds. The video was shot between April and May and already some of the info like Starwood Hotels in SL is outdated. Time moves pretty quickly in virtual worlds. The original video is two minutes longer and it actually gets into the heart of the virtual world experience. But, since the audience for this video is people (educators more specifically) who have never heard of virtual worlds, I thought I would scale the images and videos back and feature more Real Life than virtual life. Sony’s announcement of its entrance into the virtual world market in March wasn’t taken very seriously by many people . Sony’s virtual world “Home” connects PS3 (Playstation 3) users over a broadband connection to other PS3 users where they can create avatars, watch and upload movies, and socialize. Initially, Sony didn’t get the fanfare response they were hoping. One reason is that Home isn’t as open as Second Life or There.com. In fact, most people considered Sony’s Home to be a very controlled environment. Most of the development of Home will be created by Sony and users will have few options to customize the world beyond avatar tools. One of the advantages however is that users receive an apartment when they enter the world. I still think owning individual land is a major piece of the Virtual World experience and serves as a factor for virtual world adoption, more on that later. A new game being developed for PS3 with virtual world implications is generating quite a bit of excitement. Little Big Planet is a game that allows users to create and share their own content, download and play other users levels, and allows for cooperative play with other users. The graphics and physics engine are amazing and the hope is that Sony will tie this game into Home, allowing user to meet, form social networks, create group level challenges, and more. Could Sony possible allow Little Big Planet to become a developer tool kit for it’s virtual world? Watch this video to see how intuitive the building tools are and to see the amazing graphics and physics. Remember, PS3 is a console based system and the game itself runs on a disc, it isn’t streamed over the web like Second Life. 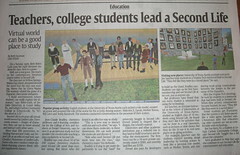 Beth Sussman from USA Today wrote a short piece about universities teaching in Second Life. Beth Ritter-Guth, a resident of the Educators Coop, is quoted in the article as she describes her Literature Alive! program in Second Life. I also get a nice quote towards the end of the article ,but, what I’m most excited about is that they printed pictures of my class. This article is nice because it helps to explain the types of teaching activities some of us are doing in Second Life. The article even made the light bulb click for my dad who now has a good understanding of my work. He even made a few excellent wisecracks. The funniest is his comparison of the role-play activity featuring Malcolm X and Mother Teresa with the movie Bill and Ted’s Excellent Adventure. He membered (yes, he said it just like this) how I constantly watched Bill and Ted with my younger brother. Anyway, for those not familiar with one the greatest movies of all time I’ll give you the basic plot. Bill and Ted are a couple of high school metal-heads with dreams of becoming a super rock group called the Wylde Stallions. Bill and Ted are both failing high school history and if they don’t pass the class, Bill’s dad will send him to military school. 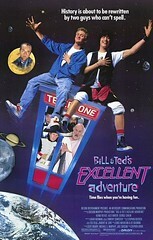 As Bill and Ted try and figure out how to pass they are confronted by Rufus (George Carlin). Rufus is a man from the future who eventually tells Bill and Ted that they are going to be a super big rock band who will eventually bring about world peace, but, they must pass their history class. Rufus gives them a time machine and the adventure begins. The movie ends with a climactic finish when Bill and Ted bring Ghengis Kahn, Abraham Lincoln, Joan of Arc and many others into their history class presentation. So, My dad equates role-play in Second Life with Bill and Ted’s Excellent Adventure.